How is the pka related to the ph of the solution for an amine? So was reading a magazine for competitive exams and this question is bugging me a lot. How is pka values of a base associated with the pH of the solution. The solution for it is that the Nitrogens would remain this way and only the H from OH would be dissociated. That's obvious because the medium is basic and the acidic H would be dissociated, but what about the nitrogen atoms? How is the pka of a base represented? Is that the equilibrium constant for it's conjugate base? The pKa's quoted for the amine groups are for the protonated forms of the amines. The protonated forms would add a +1 charge to the molecule in solution. 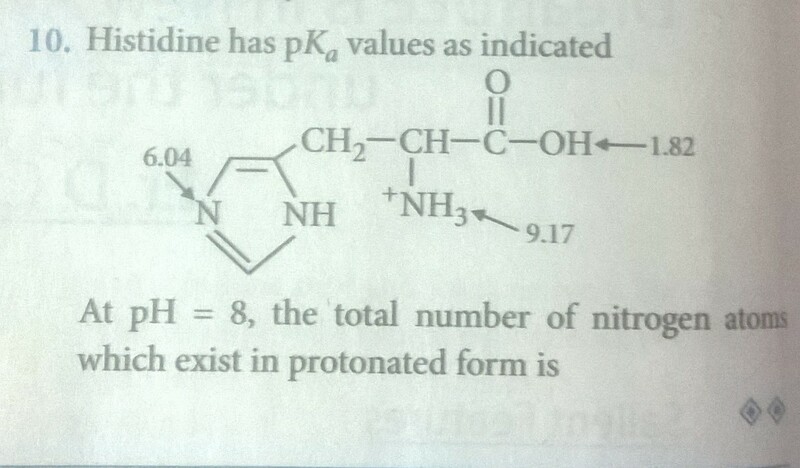 Since amines are fundamentally basic, the protonated amine is a conjugate acid. Not the answer you're looking for? Browse other questions tagged acid-base equilibrium or ask your own question. How to create a buffer solution from NaOH and CH₃COOH? Why is pH used as a measure of acidity if not only hydronium ions can act as a acid when in solution? Can the effect of resonance on acidity be generalised? Can amines in acidic medium last for long? Why does pH increase as a weak acid becomes more dissociated?